Cary, there are a number of different methods of charging an air rifle. There is the old favourite with its inbulit cylinder that you arm pulling breaking the barrel open and locking back a plunger, there is the venerable old Daisy BB system, some use a CO2 soda syphon bomblet, some you can charge off a SCUBA tank...I would imagine that you could charge this type with a compressor. I'm sure there are other methods of charging. I read a little about air rifles. They sound attractive. I never got into how they are charged. Anybody got any information on that. If they could be charged with a standard air compresser, I'd consider getting one. 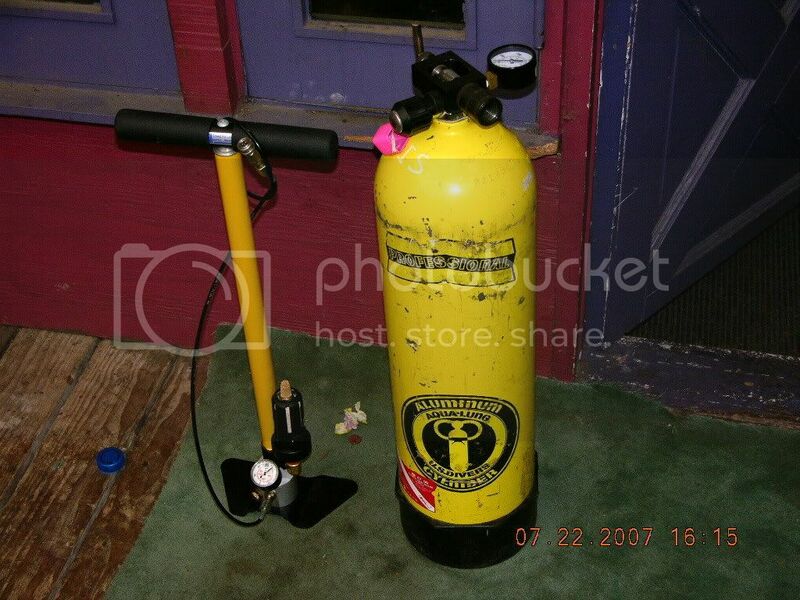 I use a scuba tank with a special yoke attached, and also (mostly) a manual pump (like a bike pump on roids). Pumps up to about 3000psi with a reasonable amount of effort. Do you get only one shot per charge with the big bore air rifles? I've got a small pellet gun. It's one of those one-pump models. It is a .117 pellet model that also shoots BBs. I just use that for plinking at a can or a fence post from the back porch, or to run off stray dogs. It's fun. I read about the big bore air rifles about a year ago and thought they were pretty expensive. The company I was checking out was selling them for over a thousand, but they looked impressive. I've never been one to purchase a fancy weapon. The wood carving never killed a will hog or a good buck. I'd spend most of my time worrying about scratching it. I like the kind you don't worry about bouncing it around in the pickup. I would consider purchasing one that was comparable in price with an average rifle of the same caliber. Anybody got any comments about a good reasonably priced brand name to look at. With the modded .45 big-bore I have, I get 4 or 5 powerful shots that take me from 3100psi down to around 2400-2500psi or so. I stop there because I use a hand-pump most of the time in the field, and get the most for my pumping effort that way. The top part of the fill is a lot easier to fill than the bottom. I may get more shots per fill (6-8) with the lighter roundball if I am willing to shoot the fill down more. For a powerful utility-type air rifle, that needs no modifications and has lots of performance right out the box (with a lot more shots per fill), I highly recommend the Sumatra 2500 Carbine in .25. That will likely be my next .25 air rifle, as I was forced to sell my other .25 which retails for much more. The Sumatra 2500 has a powerwheel on it that adjusts the power from 0fps up to way-to-many fps (LOL) so you can go from low-powered backyard pest bird control, to Raccoon, JackRabbits, or Fox at 75 yards with the turn of the dial. Another thing that sets this gun apart is that it is a lever-action repeater. This comes in very handy for when there is more than one raccoon raiding the hen-house. I suggest ordering from Mac1 airguns, as he is a third-generation airgunsmith, and goes over the Sumatra with a fine tooth comb, making a couple of modifications to the gun that really make a difference. If he is to back-ordered or something, I would go with StraightShooters. Some think the Korean guns are ugly, but their high performance at such a low price-point is what got me hooked. Be sure to order the Korean EJ pellets, as the Korean barrels are of a slightly larger diameter than most airgun barrels. If you can't find the 42 (yes 42!) grainer EJ's, e-mail me and I'll point you in the right direction. These guns need to be turned down to shoot the lighter pellets or else they push them way to fast to remain accurate. Also, these guns are LOUD. If you want to quiet it down to mouse-fart levels, I can point you in the right direction for that, too. I prefer a break action single shot . Thanks for all of the information. I didn't know that they had multi-shot air rifles of larger caiber than your standard pellet gun. I want one that is powerfull enough to kill a 200 wild hog or a whitetail deer. Any suggestions on that. It doesn't make any difference how loud it is, there's no one out here to listen to it but me. What calibers do the Gamo Hunter air guns come in? I was thinking that I'd need something 30 caliber or larger. In that case, you want the SamYang909 in .45; there are two versions of the gun. You will want the DOUBLE AIRTUBE version as it makes a big difference in shot count, and your velocity won't immediately start dropping after a shot or two like the single tube. Then you will want to send it to this guy for a power mod. I'm headed out in the morning to go hunt wild hogs in Oklahoma along with four other airgunners. I'll let you guys know what happens! This ought to be good information...How big will the [wild] hogs be? Are they really wild hogs or Feral pigs...? Have a good hunt, can't wait for the field report! Bushmaster, in NC we have several counties with limited "boar" seasons. When that critter crosses into another county he becomes a "feral pig" and can be shot at any time... You gotta love the folks who write game and gun laws!